My collection of knitting books has grown at an alarming rate over the past two years, mostly in the reference area but with a good few sock and handspun pattern collections thrown in. I refer to all of them often, but it's the Sock Sweater that really justifies the volume of volumes. I am using three to figure out this pattern as I go. 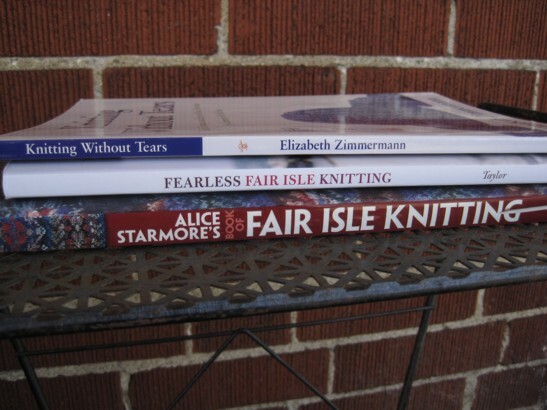 The first is Elizabeth Zimmermann's Knitting Without Tears, with its famous percentage system for calculating the number of stitches and inches you need for any given shape or size of sweater. Not to mention how to hook up the arms for a yoked sweater worked in the round. For a couple of minutes I thought maybe I'd be spared working out those specifics because I got perfect gauge (amazing!) with a very lovely yoked men's sweater in Kathleen Taylor's Fearless Fair Isle Knitting. Alas, the size I wanted fell between two of the sizes given, and as I have only about a third of the variety of colour shown there my version of the charted patterns would have looked a lot less striking. I'll still benefit from the technique used to decrease stitches neatly along the length of the yoke though. And I've already benefited from the yardage specifications; figuring out how much to buy for my sweater was a breeze. 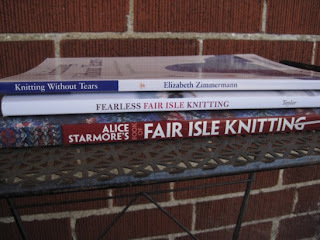 It's pretty obvious where Alice Starmore's Book of Fair Isle Knitting comes in. The charts! Yes, I could work these out myself, and I probably will do so in a few places as I try to work in all my colours to their fullest extent (because otherwise I won't have enough yarn for the entire sweater), but the huge variety of colour patterns in this book are going to be a lifesaver. At the moment I don't have to think about many of these details, as I'm still on the lower part of the body and about halfway through the first skein. But my baby-sized knitting project is fast growing out of its walking around stage and becoming lap knitting, so I'll have to do something drastic soon, like cast on a sleeve. And the sleeves, my friends, will be patterned. Just as well the knitting roster is set to clear up a little bit today with the last of the Secret Pattern Project, yes?